The in-house magazines of Taj luxury hotel group have gone the PUR way. 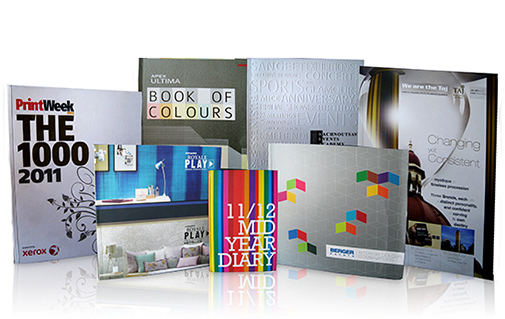 The product catalogues of the paint manufacturing giants: Asian Paints and Berger Paints, have also chosen PUR binding. The prospectus of the prestigious business school IBS was bound using PUR. Leading this creation of PUR technology awareness amongst the brand owners is an award winning commercial printer called Pragati Offset in Hyderabad. Mumbai-based Sahaya Print Services have had great success stories for the Taj magazines with PUR technology. Lovely Offset’s major export work now comprises of threadless, rounded and hard cover diaries made by Lovely Offset. PrintWeek India’s special publication The 1000, a guide which celebrated the 1000 leading printers in India, opted for PUR binding to showcase finesse in finishing and durability of the spine. PUR is durable binding solution to the eternal challenges put across by high weight coated stock, heavy ink coverage, specialty paper stock and surface finishing. It comes with bonus advantages of lay-flat binding and faster turnaround. There is an evident shift towards the conversion of hotmelt adhesives to PUR. The inhouse magazine of the luxury hotel brand The Taj has been now converted to PUR. It is a 64 page magazine consiting of 130gsm coated paper and a matt laminated cover of 250gsm. The magazine was produced at Sahaya Print Services. This product catalogue of Asian Paints consisted of 52 pages using a 180gsm paper and a cover of 300gsm which was matt laminated. . The book was bound using PUR at Pragati Offset. The prospectus of the prestigious IBS business school was bound using PUR. The book made use of specialty paper for inside pages as well as the cover. The pages consisted of 150gsm and the cover was using a 300gsm specialty stock. This job was produced for exports at Lovely Offset. The diary is threadless and is harbound and features a rounded back. The product catalogue of other paint major was also bound using PUR technology. The book featured 32 page catalogue of 220gsm and a 300gsm cover. In the coming months, there will be more brands from the automobile, luxury, stationery and educational segments lining up their products to get “perfect-bound” on PUR. The training team of Henkel and Welbound for PUR adoption technology reached Gujarat, with recent stops at Repro India in Surat and Printwell Offset in Ahmedabad. Repro India, one of the top book print exporters from India has an SEZ unit in Surat which does most of its export work. It had installed an inline perfect binding solution with the PUR option for a number of jobs which it did for Cambridge University Press and for book exports to African market. Santanu Roy, Repro India Ltd, Surat with WB 36000 PUR technology becomes important for the export work at Repro India because of the demands of the foreign market. The African market for text books is dominated by book printers from India. Similar to the educational publishers in India, the publishers of these books insist on thread sewing before drawing the cover using an adhesive binder. Thread sewing is a major bottle neck when it comes to delivering huge quantities of text books in a short period. Some of the African countries are now moving towards preferring PUR bound books in lieu of the thread sewn-cover pasted model. The best example is a recent tender for textbooks from Malawi. Santanu Roy, general manager for operations at the Surat unit is quite upbeat about PUR. "Internationally, the publishers are increasingly demanding books done with PUR binding. It is an added advantage for us as the workflow becomes seamless and the perfect binder is not kept waiting for the book blocks to arrive from the sewing machines.” Talking about the finishing aspect of PUR binding Roy added: “The page pull strength of PUR is far superior than thread sewn books. When it comes to exports, we need not worry if the consignment is going to a cold country or a very hot one. Once we inspect the books at our facility, there is no way that the binding can fail at any later stage." Like every new technology that needs the know-how of its basics, it was necessary that the Machine crew at Repro India knew the intricacies of PUR technology for comfortable handling and better output. Roy felt that adopting PUR technology is a learning curve and “this is where PUR promoters and partners like Henkel and Welbound add value. The Henkel-Welbound team has trained our shopfloor team with the basics of handling PUR adhesive right from operating conditions tomachine settings, cleaning and maintenance of equipment. They have provided our machine crew with necessary technical data like ideal application temperature, hose temperature, adhesive thickness and roller settings.” Henkel also provided the information on the important safety norms along with the necessary kit.